It’s tempting to go out riding on off-highway vehicles (OHV) after a rainstorm — the ground is fresh, dust is down and it’s cooler out. But when rainstorms leave roads and trails wet and muddy, riding on them can create long-lasting damage that negatively impacts the habitat and the experience for other outdoor enthusiasts. When you come upon wet and muddy roads, turn around. When the area is wet, riding can tear up the roads and trails making them impassible for others. In addition, OHVs can do serious damage to meadows, streams and other areas important to wildlife and Arizona’s water supply. 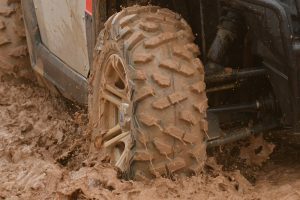 Even a lighter-weight OHV with low-pressure tires can do lasting damage. While the practice of “mudding” — purposefully driving through wet areas, whether it’s a meadow, lakeshore or water tank for wildlife or ranchers’ animals — may be touted as fun on places like social media, it can cause long-lasting damage to the habitat and forest roads. OHV riders can be issued citations and be held liable to fix the damage caused. It can cost tens of thousands of dollars to repair an area and an untold amount of time for a habitat to recover. Rips up native plants — when plants are gone soil washes into nearby streams and lakes, and it creates the opportunity for noxious weeds to move in. Compacts soil — tire tracks create hard soil that keeps water from moving into the ground and they make it difficult for plants to grow. Harms wildlife — when vehicles tear up meadows and wetlands, it removes nesting and hiding cover, interferes with feeding, and may push animals out into areas where they may not survive. Smothers fish — many species of fish and amphibians use gravel to build nests and bury their eggs. Driving through streams destroys these gravel areas. It’s also a safety issue for riders. OHVs handle differently on wet roads than they do on dry ground, so use caution and drive at slower speeds when roads and trails are wet. If you see someone mudding, call 1-800-VANDALS. It’s helpful if you can get a license plate number and description of both the OHV and the operator as well as a location of the activity so law enforcement personnel can follow up on the information.